During today's walk one of my neighbors yelled across the street, "You have it made!" I considered the situation: Me covered in baby spit up, pushing the double stroller while carrying a bag of dog poo in one hand and straining to prevent Snacks from leaping in front of an oncoming truck with the other. I laughed, thinking he was joking. But then he went on about how great it must be that the dog was pulling the stroller for me -- you know, like a sled dog. Sigh. Things just aren't always as they seem. Snacks was definitely, how shall we say, spirited, during today's work. Blame that on having not had a walk in a few days. He plowed ahead on the street with the eagerness of a husky about to win the Iditarod -- if said husky also stopped frequently to pee on rocks and piles of leafs and also growl at pumpkins (Snacks, is highly suspicious of jack-o-lanterns). Note baby spit-up on left haunch. As you might have noticed, Jovie has been quite productive in the spit-up department today. In fact, I was on my second shirt of the day (the first had not only fallen victim to Jovie, but also Lily, who inexplicably decided to smear yogurt all over herself, the high chair and me rather then eating it at lunch). He bats for the blue team. 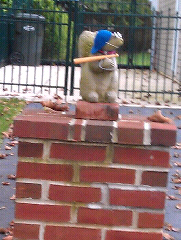 He's the catcher for the blue team. In case you're wondering why my squirrel pictures are so pixelated, it's because I try to snap photos of them casually, so I'm never close enough and never do too much zooming (the dog yanking on my arm doesn't help matters). I already feel kind of shady snapping pictures of my neighbor's house, so I don't like to linger too long. 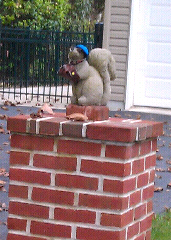 I know one day one of the squirrel ladies will come out and question my ongoing surveillance. At the crazy kids' house there were at least 10 bicycles and various other wheeled conveyance littering the front yard. Garage clean-out day? Does that seem like an unusual number of bicycles for a family of five (by my estimate?). 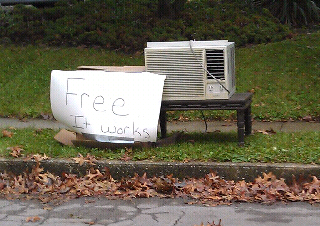 That's right, a free, functional AC, just left there! Maybe the trash pickers are getting a little choosier. Anyway, if you're looking for a window unit, let me know. Is Brad planning some surgery I'm unaware of? 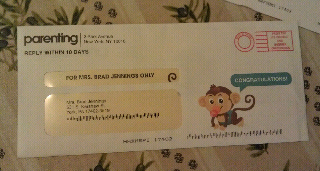 Apparently, Parenting isn't aware that I'm a budding feminist or else they wouldn't have referred to me (at least I presume they're trying to reach me) as Mrs. Brad Jennings. TWICE! This reminded me to tease to a future blog post: My letter to Goodyear. The other day while continuing to bristle over the whole tire-cident of last week, I entertained myself for a good part of the day by composing a letter to Goodyear, thanking them for saving me from my small, female brain. Stay tuned. And to come full circle with neighbors yelling at me during my walk - a few weeks ago another neighbor and blog reader shouted at me from her front porch: "You finish that novel yet?" Crap. People remembered I said I was gonna do that? Not only have I not been writing that novel. I've also neglected writing about writing that novel. I got an e-mail this week from the National Write a Novel in a Month folks reminding me that NaNoWriMo starts in a month. In a moment of procrastination, despair and sanity-saving, I deleted the it. Sleep is a precious commodity around here these days, that's being rapidly depleted by things like parenting, freelancing, cleaning, cooking and walking. In theory, the idea of participating in "30 days and nights of literary abandon" sounds like fun (and last year it helped me put a significant dent in the novel). However, I feel the girls do not deserve 30 days and nights of cranky mothering.